CherryActive is a range of premium quality nutritional supplements designed for the modern lifestyle. Montmorency cherries are the main ingredient in CherryActive concentrate & capsules. These cherries contain natural compounds with healing properties against inflammatory conditions. They also help with gout, arthritis and inflammation. The product range of concentrates and capsules contain no sweeteners, preservatives, flavourings or added sugar – a natural and healthy food supplement. Our capsules are free of any anti-caking agents and fillers, they are just packed with 100% goodness. Lots of top athletes use the products to assist them perform at their best. It is also popular with active, health conscious people who want to feel their best. 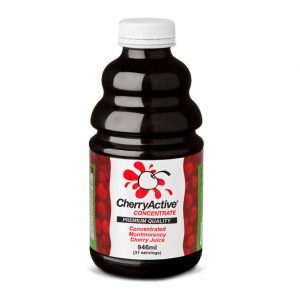 Cherry Active Concentrate is in liquid format and its natural sweetener has low GL. The companies products are available from the New Harmony Health Food Store at High Street Tuam, County Galway, both over the counter or through our online shop nationwide.